Another special card in from our Luis Aparicio collection. I won this one off eBay and it arrived in the mail two days later on Saturday, August 20. It's your basic UD sticker auto with a big, foily White Sox logo. Pretty cool and it's numbered to just 25. I'm not really a fan of the cards Panini put out last year. 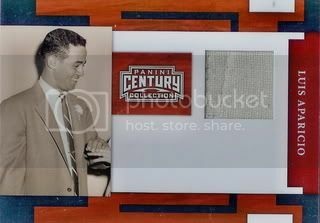 I know they didn't have MLB licensing so they couldn't include pictures of the players in their uniforms but I just can't get too excited over a card with Luis Aparicio wearing a suit and tie. This card does have a decent size swatch from what I'm assuming was one of Lil Luis's jerseys. The back refers to it as "material... worn... in a Profession Baseball Game." I'm just glad to have another relic card for our collection. This one's even numbered to 250. 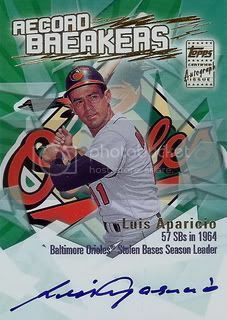 Our Luis Aparicio week continues with another 2011 release. 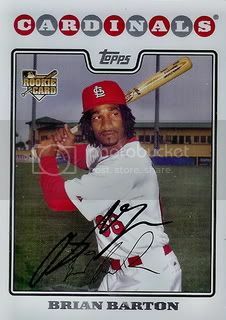 This little Lil Luis card is from the 2011 Topps Kimball Champions insert set. I don't normally like mini cards but for some reason these are almost okay. Topps keeps pumping out cards of vintage stars and Hall of Famers in their new products. 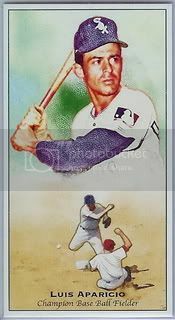 This Lil Luis card is a reprint of his 1958 Topps card and is part of the "60 Years of Topps" 2011 insert set. 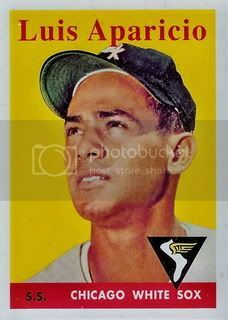 The 1958 Topps design is one of my all-time favorites so I'm glad they chose to reproduce Luis's card from that year. I don't have the original so this will have to do for now. 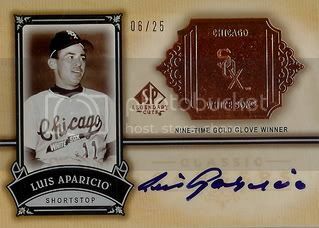 I just realized I haven't posted anything new for our Luis Aparicio player collection in over two months. I've acquired seven new Lil Luis cards and will be doing a post for each every day this week. First up is a nice card I've had my eye on for years. My Dad finally bought this certified autograph of Luis Aparicio from the 2003 Topps set. A nice on-card auto with Luis pictured on the Baltimore Orioles. Since this one came from my Dad, it's extra special. Thanks, Dad! Former Toronto Blue Jays pitcher and current Chicago Cub, Randy Wells signed a card for our set. Another nice one today. We picked up this signed 08 Topps card of two-time All-Star Brad Penny. 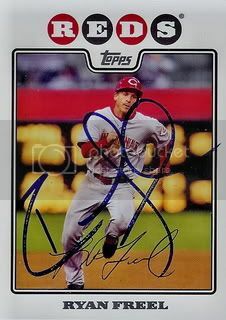 I was able to work out a trade with a blog reader to add this signed card of Ryan Freel to our 08 Topps set. Nice card with a nice BIG signature. In yesterday's post I mentioned how I wanted to pick up a few more of the 1986 Mets autographs that were inserted into the 2008 Topps 55 card team gift sets. Well I've got one more to show you and it's a good one... Keith Hernandez! 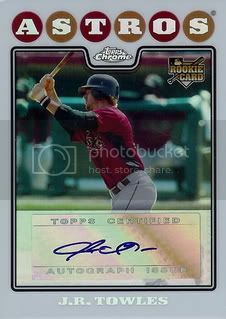 Hands down this is the coolest certified autograph in our 2008 Topps collection. 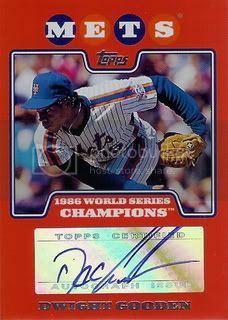 This signed card of Dwight Gooden came from the Mets 55 card team gift set. 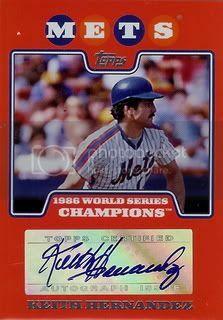 Topps inserted one autograph of a player from the 1986 Mets into each of the team sets. The team sets alone are pretty hard to find. I was glad to be able to pick up one of the better autographs. This is just a great card. The orange border really stands out. The sticker is well placed. Hopefully I can pick up a few more of these at a good price. I've been wanting to add a J.R. Towles certified Chrome auto to our collection for awhile now. While I still haven't picked up his regular auto, this Refractor is even better. The NFL season is less than a month away. Seems like a good time to do our first ever post on a 2008 Topps football card. 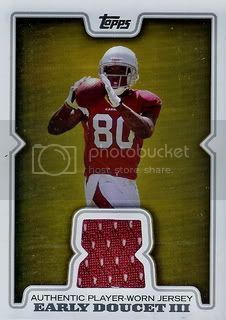 We picked up this jersey card of Arizona Cardinals wide receiver, Early Doucet. If the Cards don't sign a free agent WR, Early will probably be their number two guy this year. 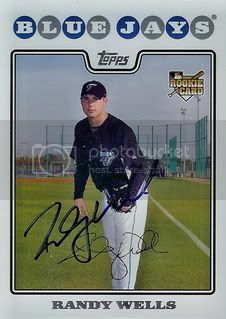 The 2011 Topps Lineage set was released a little over a week ago. Pretty cool set but the checklist for autographs is pretty horrible. 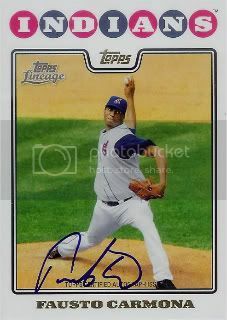 Except of course the 2008 Topps Reprint auto of Fausto Carmona. While I don't really understand why they remade cards from the past three years, I'm glad to have a new 08 Topps card to add to our collection. After spending some time in the Atlantic League last year, Brian Barton is now with the Cincinnatti Reds organization. 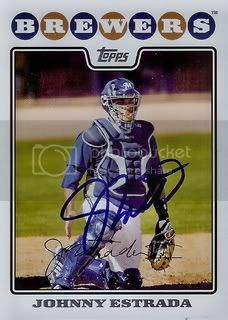 We recently added his card from Series 2 of the 2008 Topps set to our collection. Dan Uggla has been one of the hottest players the past few weeks. We recently picked up one of his jersey cards from the 2008 Topps set. Nice card with a slight pinstripe on the left side of the swatch. 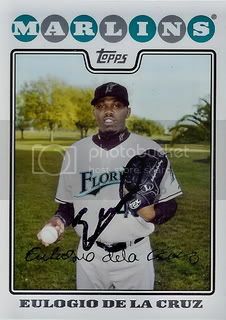 Former Florida Marlins reliever, Eulogio De La Cruz signed a card for our set. Eulogio is now with the Milwaukee Brewers organization. I saw him in Spring Training but he didn't sign. Luckily he was nice enough to answer our request TTM. 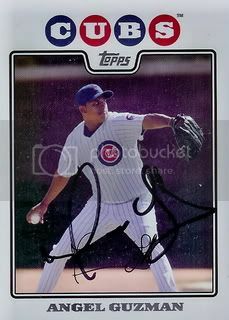 Chicago Cubs reliever, Angel Guzman signed a card for our set. Angel is still with the Cubs organization but he hasn't played in the Majors since 2009. Another good one for our set. 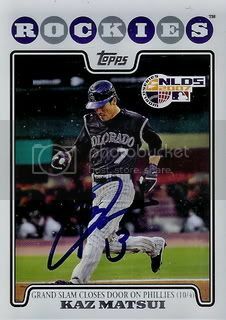 We picked up this signed card of former Colorado Rockies infielder, Kaz Matsui recently. Per his Wikipedia page, Kaz is back playing baseball in Japan. 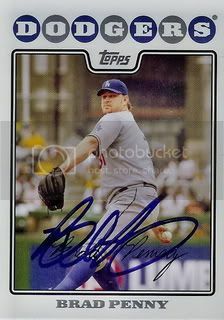 I know our posts have been sporadic lately but we're back with some more autographed 2008 Topps cards. 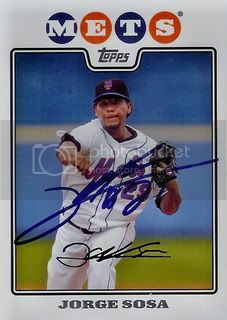 We recently added this signed card of 2004 NL All-Star, Johnny Estrada to our set.